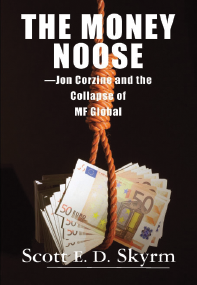 In the first book published about the collapse of MF Global in October 2011, Scott Skyrm describes the two ways a noose can kill you. There is the quick way, when it breaks your neck as the trapdoor falls out from underneath you, and there is the slow way, when it slowly cuts off oxygen over an extremely agonizing 10 minutes. MF Global’s demise was the slow, excruciating way. In his autopsy of MF Global, Skrym argues that a combination of economic conditions (particularly concerning the European debt crisis), a change in accounting requirements and finally, the self-preservation actions of banks, clearinghouses, counterparties and clients who had relationships with MF Global combined in a perfect storm to tighten the money noose slowly. Add to that a high-profile CEO who knew he had a hard-stop deadline of Sept. 30, 2011 from the credit rating agencies to show at least $250 million in pretax annual profits or risk any dream of being considered a good investment or counterparty. If you are interested in a chronicle of the activity in MF Global’s final days, jump straight to page 169. In my opinion, Skyrm correctly identifies the beginning of the end as Oct. 17, 2011 when The Wall Street Journal published an article with the headline “MF Global told to boost capital.” That article, which brought to light capital issues initially disclosed in June, was “the spark that would become a bonfire,” he writes. Within 10 days, the company had reported a $191 million quarterly loss because of reporting changes required by regulators and auditors over the summer that related to the European debt trades, and its credit rating had been downgraded to junk. Within 14 days, it had declared bankruptcy. However, if you are interested in understanding the backstory to MF Global and its business and risk-management practices as well as the why and how of the many dominoes that fell, start at the beginning of Skyrm’s book. You’ll come away with good explanations of how the futures markets work, the roots of the European debt crisis and how the repo markets work — all of which help you understand why Corzine/MF Global were so attracted to trading sovereign debt in PIIGS with billions of dollars of house money. Skyrm obviously knows his stuff, as you would expect given his 22+ years on Wall Street. And, he obviously has a lot of the details about what went on at MF Global, particularly during Corzine’s reign, which began in March 2010. You would assume that his information mostly came from public records made available following the bankruptcy, but nowhere does it say for sure, which would give the reader confidence that the information is accurate. And, although his numerous chapter-opening analogies are good, their length at times unnecessarily interrupts the book’s flow. As for pointing the finger at who was to blame for the criminal act of moving customer segregated funds into company-owned coffers, Skyrm leaves that to lawsuits pending at the time of writing and publication (notably before the Commodity Futures Trading Commission’s filing in late June 2013 against Corzine and Assistant Treasurer Edith O’Brien). However, he does make a pointed observation that the “few organizations” that control margin and leverage in international markets are a “mini-monopoly” and “can be a death knell for firms.” Indeed, a death knell by noose. Susan Abbott Gidel is owner of SusanGSays LLC, a copywriting and marketing consultancy in Chicago. She was vice president of retail marketing at MF Global when it declared bankruptcy. She blogs about the markets and industry issues at www.susangsays.com/opinion/my-write-hand-blog. Susan Abbott Gidel is owner of SusanGSays LLC, a marketing strategy, timing and copywriting consultancy in Chicago. She can be reached at http://susangsays.com/home.